Vermont's Woodstock Inn & Resort has unveiled a giant gingerbread house that towers above the rest. The creation of pastry chef Lerome Campbell and his team stands 9 feet tall from its base to rooftop. It's 7 feet long, and has ceilings high enough for most people to carefully stand up beneath. "We have about 180 pounds of flour in there," Campbell told New England Cable News. "Confectioners sugar? I'm going to say about 150 pounds." The gingerbread house was about three weeks in the making, Campbell said. It's mostly edible, but is built over a wooden frame. 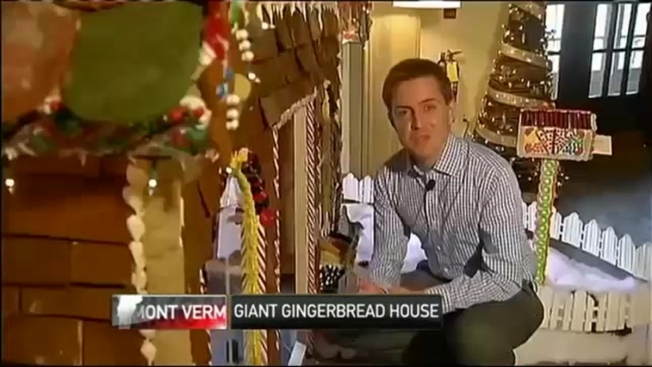 Campbell explained there is so much gingerbread — more than 350 shingles on the roof and 700 bricks on the walls — that it would need a sturdy wooden frame to bear the weight of the gingerbread, icing, and candy. Campbell said he has worked on even larger gingerbread houses before. At a previous job at the Ritz-Carlton in Naples, Florida, Campbell said he once helped construct a taller house than the one in Woodstock. "I always shoot for the 'wow effect' in people," Campbell told NECN. "I've never seen anything like it," said Robin McCluskey, a traveler visiting Woodstock from the Boston area. "It's just wonderful." "There's no detail spared," added McCluskey's friend, Kate Brown, who was marveling at the giant gingerbread house's windows, trim, and flowerboxes, which are filled with lollipop blooms and shredded wheat soil. "It's just amazing!" This mansion of the gingerbread house world will be up at the Woodstock Inn & Resort until the start of 2015. Campbell said the wooden frame will be saved for use in future years, as a base over which fresh candy decorations and gingerbread tiles can be applied. The Woodstock Inn & Resort has a series of Christmas events and outdoor winter activities, like dog sledding, planned for the next several weeks. For more, visit the destination's website. For additional information on planning a visit to Vermont during the winter, visit the website of the state's Department of Tourism and Marketing and Ski Vermont.